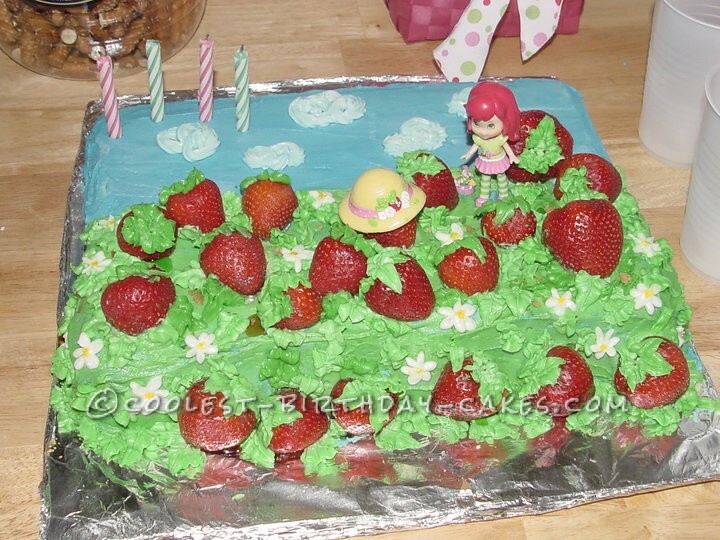 For my daughter’s 4th birthday party, our theme was Strawberry Shortcake. I wanted a cake that was different from anything I had seen and that she would love! My daughter absolutely loves fresh strawberries, so I decided to use fresh strawberries to make a strawberry patch cake and give it a 3D appearance. She was so excited when I told her about my idea! I let her help me mix up her favorite cake (homemade cream cheese pound cake, of course) and she got to help with the homemade butter cream icing! We bought a mini Strawberry Shortcake doll (complete with gardening hat!) to use as a cake decoration and a gift for her to keep!! Well, the hat wouldn’t stay on the doll’s head, so we improvised and set it on top of one of the juicy strawberries for safe keeping! I made 3D clouds on the cake to finish it off. My daughter was beyond thrilled with how it turned out! I got some many compliments on the cake. In fact, everyone said it was too pretty to eat! Of course after all my hard work, I truly wanted everyone to enjoy eating it as much as I had enjoyed making it. My daughter is turning 7 soon and still says this is her favorite birthday cake! !